Insects in numbers, both of species and populations, far outweigh any others on earth. 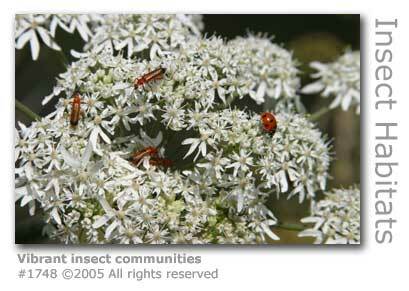 The Wey Valley boasts a rich and varied community of invertebrates supported by healthy habitats. "Any fortysomething must have noticed the decline in insects over the years. As a child, I remember the car winscreen being splattered with exploding insects within a few miles on a fast road. The car has taken its toll on our insect population but so have modern farming methods. Decades of chemicals being used in small gardens mean that ordinary gardeners have done their fair share too." Surrey Wildlife Trust rangers are closely involved in redeveloping habitats ideal for stabilising and building insect communities, which in return provide considerable benefits for the plant and animal life living in them. 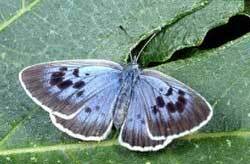 The Surrey Advertiser (July 2005) covered a significant achievement by the Trust as it released 50 female Silver Studded Blue (Plebeius argus) butterflies, currently a rare species, onto Ockham Common near Wisley. The butterflies had been collected from Fairmile Common at Cobham by Elmbridge Borough Council rangers. The conservation group Butterfly Conservation are working closely with the Trust to provide specialist advice and practical support. This project provides a good example of how finely tuned habitats have to be. In order for Silver-studded Blues to breed successfully the butterfly needs common black garden ants (Lasius niger) to have colonised the heathland’s floor, and for there to be bare soil patches and ideally bell heather present to encourage this. The ants use the bare soil in which to build their nests, and like to feed on a sweet substance that that the larvae of the butterflies secrete. To do this the ants carry the larvae down into their nests in an effort to protect the larvae from predators, and the conditions within the nest are perfect for the larvae to pupate. This perfect symbiotic relationship provides the focus for developing and maintaining a suitable habitat. The heather provides an ideal soil temperature for the ant nests. Similar projects have enabled local populations of birds such as the Stonechat and Dartford Warbler to thrive. One year on (July 2006) in the run-up to Butterfly Conservation's Save Our Butterfly Week (July 22 - 30) the Surrey Wildlife Trust released an update into how the reintroduction of the Silver-studded Blue at Ockham Common had fared. “In terms of where we are this year, the reintroduction could be described as in its early stages," said Trust ranger James Adler. “We have adult butterflies on the wing, which means they have found some ant colonies and hatched out from eggs over the year. However, the numbers seen have been below expectations. This could be from a wide range of factors but most likely it is due to the soil temperatures not being quite hot enough because of the height of the heather. This means that the ant colonies are not as common as we would like." Intense conservation efforts have enabled six of Britain's threatened butterfly species to start to recover in numbers (May 2006). The revival illustrates well the need to extend such efforts much more widely to try and counter the overall decline being experienced across three quarters of Britain's 60 species of butterfly. The most remarkable recovery has been with the Large Blue which was recorded as being effectively extinct 25 years ago. The Large Blue follows an extremely specialised life cycle, similar to that of the Silver-studded Blue (see article above) that were successfully re-introduced into the Wey Valley by the Surrey Wildlife Trust in 2005. The species uses ants nests for part of the reproductive cycle taking advantage of the dry and warmth, and also protection from predators. 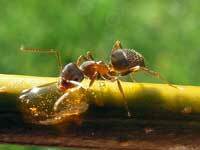 In return the ants feed off secretions from the butterfly larvae. Butterfly Conservation have published (2006) a study, The State of Butterflies in Britain and Ireland which details the population trends and distribution of butterflies across the British Isles. The report highlights the fact that butterflies are declining at a faster rate than either birds or wild flowers, largely because they are more susceptible to environmental change. Many need specialised habitats, such as short-grazed turf or coppiced woodland (in which the trees are cut in rotation leaving open glades) and if traditional farming management changes or is replaced, the butterflies tend to disappear. Over the past decade knowledge of butterflies' life cycles and habitat needs has increased enabling accurately targeted conservation measures to be introduced. These measures have not been introduced exclusively into nature reserves, but have also provided for habitat protection on farmland through new agri-environmental schemes which rewards the farmer for their support. "What the increases in these six species show is that conservation measures are beginning to reverse the really severe declines our butterflies have been suffering from," said Martin Warren, Butterfly Conservation's CEO. "To have some success in halting that is quite an achievement. But we need a lot more of it because we have a lot more species to turn around as well." Recent reports (July 2007) suggest that the large tortoiseshell (Nymphalis polychloros) is no longer an extinct species as declared in the 1960s in Britain as sightings in Surrey and elsewhere in southern England indicate that re-colonisation may have occurred. "There has been a relatively high number of sightings of the large tortoiseshell recently," said Richard Fox of British Butterfly Conversation. "Many of them of newly emerged adults. It doesn't necessarily follow that there are breeding colonies here - but it is a possibility." It could mean that the butterfies have blown over from the Continent - or even been released into the wild by enthusiasts. but to have so many sightings over such a widespread area is exciting. we will certainly monitor the situation." Mayfly are in evidence along the River Wey but not all species are faring equally. As reported in the UK Biodiversity Action Plan 1999 the Heptageniidae longicauda Mayfly species was first recorded in 1868 in Britain near Reading (Berkshire) on the Kennet and Holybrook Canal. The last record in Britain was from the River Wey, between Tilford and Elstead, in Surrey in 1933. There have been no further records despite searches in the River Wey and the Thames catchment. The species still remains classified as endangered rather than extinct in the hope that further research will prove its existence. The banded demoiselle (Calopteryx splendens) is one of Britain's largest damselflies and looks similar to the dragonfly. Historically it has been found mainly in southern England where its numbers went into a steep decline towards the end of the last century mainly due to pressure from agriculture. A survey as part of National Insect Week (19th June 2006) is expected to confirm findings that indicate a healthy recovery of the species. As well as a return to southern england populations have been successfully established across Britain. 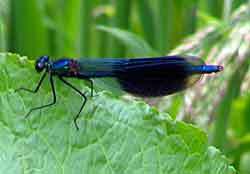 The demoiselle lives along slow-moving rivers, canals and streams with ample vegetation along its banks, with the Wey and its tributaries being perfect habitats. The female dives underwater to lay her eggs on the stems of heavy plants and breathes air she has trapped between her wings to survive. The stick-like larvae live underwater for two years before crawling up the stems into the air where they transform into the brightly coloured winged adults. Adults only have two weeks of life in which to breed before dying. The 1960s and 1970s had seen the species in sharp decline due to water pollution and the effects of ever increasing intensive farming methods being introduced. Since then there has been a gradual improvement in water quality with series pollution incidents down by over 70% over the past decade. "England and Wales now enjoy the cleanest rivers, streams, ponds and lakes in living memory, and this success translates to the health of insect populations, such as dragonflies that rely on these ecosystems for their survival," said Alastair Driver, national conservation officer for the Environment Agency. The effects of global warming has encouraged the insect to expand its favoured habitat beyond southern England. Closely related to the damselfly, dragonflies (Anisoptera) inhabit the full length of the Wey Valley living on and around the river, its tributaries and ponds. The difference between the two involves size, behaviour and their wing configuration. Damselflies have all four wings similar in size and shape and are usually small, weak flying insects that stay close to the water margins and water surface. Dragonflies have shorter and broader hind-wings, are larger and stronger and can be found often some way away from a water source. Dragonflies also have larger eyes that almost touch and when at rest hold their wings out usually horizontally to their bodies. There are at least 34 different varieties of dragonfly native to Britain and these include the family classifications of Hawker (Aeshnidae), Club-tailed (Gomphidae), Golden-ringed (Cordulegastridae), Emerald (Corduliidae), and those grouped as Chasers, Skimmers and Darters (Libellulidae). Many of these can be seen along the Wey. Despite their folk names including horse-stinger which suggest that dragonflies sting they are actually harmless to humans, although they are fearsome predators of other flying insects. As a larva they will eat anything smaller than themselves, which with the larger species can include small fish or fry, but will include the larvae of other insects. Adult dragonflies will catch midges, mosquitos and other flying insects including butterflies, moths and smaller dragonflies. They themselves are prey to birds, especially wagtails and hobbies, spiders and frogs. Underwater they fall victim to larger fish as well as amphibians. Dragonflies can live from 6 months to 7 years depending upon species, but most of their lives are spent underwater in larval form with very little time as winged insects. 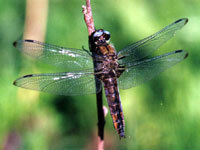 The life of a dragonfly follows a cycle of an egg usually laid underwater, larva as a free moving water dwelling nymph, and then a winged adult. The dragonfly species, Scarce Chaser (Libellula fulva), has for some time been considered at risk in the UK primarily due to changes and loss of its natural habitat. The species thrive particularly on marshy ground with dense abundant vegetation and need slow-moving streams for their larvae to develop. Since 1973 this dragonfly has become established along parts of the Wey and is quite rare across the rest of the country. 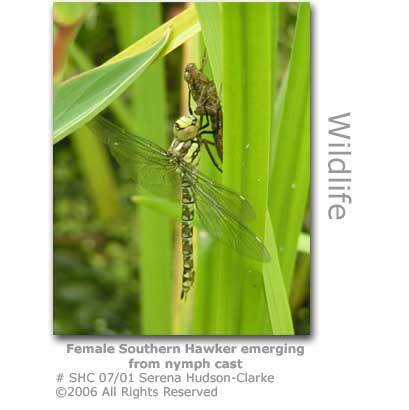 The following is a report from Thursley in the Wey Valley logged by a county recorder with the British Dragonfly Society in the summer of 2006. "Male Black Darters which I thought were early until we saw a pair oviposting. Many Small Red Damselfies, Keeled Skimmers, Black-tailed Skimmers and one Ruddy Darter. Water levels look sadly low." "Signs of approximately 10 previously emerged Brilliant Emeralds at Forked Pond but access to the waters-edge to see if any were flying was severely restricted several groups of fishermen who were trying to catch carp. On the heath to the west of the pond a good number of white-legged damsels were seen amongst the bracken together with Black-tailed Skimmers, Beautiful Demoiselles, the odd 4-spotted chaser and a couple of curious Golden-ringed dragonflies who came close to inspect us before quickly disappearing over the bracken before I could get the camera focussed." Many Wey Valley residents took part in a national survey of butterfly populations by contributing with observations made in their gardens (June 2006). The idea, based on clear identification using identification charts supplied as part of specially prepared survey packs, enabled the Butterfly Conservation Society to collect field observations from over 11,000 people nationwide. Funded in part by a grant from the Heritage Lottery Fund the results also including a moth head count will be plotted for geographical coverage, and would have been unachievable using only regular field observers. "33,000 people requested the survey pack, and 11,000 people took part - which was really quite amazing," said Charlie Rugeroni, director of development at the Society. 'It was the biggest participation project we had ever done and from that point of view alone was a great success. The media coverage and the numbers of volunteers participating and individuals wishing to join the society surpassed all our expectations." Funds were also allocated from the Society's own fund raising efforts and grants from nature and environment trusts. The Society has scheduled the 23rd September (2006) as National Moth Night to achieve the same coverage for moth population coverage. The annual event now run jointly by the Society and Atropos (the journal for butterfly, moth and dragonfly enthusiasts) was launched in 1999 and has been instrumental in providing a snapshot of the welfare of moth species in the UK. 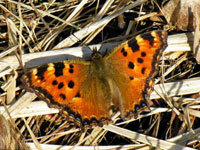 Moth and butterfly species usually quite rare to the UK are beginning to become more populous as our climate warms up. The Hummingbird Hawkmoth (Macroglossum stellatarum) originates from north Africa and levels of sightings in Britain are historically quite modest. For the last two years sightings have escalated with large numbers sighted this year (2006) right across the south of England. Some individuals of this species even made it as far north as Scotland. The Silvery Moth (Pronuba yuccasella) again from north Africa had large migrations here during July, and the Eastern Bordered Straw Moth (Heliothis nubigera) that originates in the Canary Islands was sighted 30 times, with this species before 2000 only ever having been recorded five times. "Moths and butterflies are great indicators of climate change," said Martin Warren, CEO of Butterfly Conservation. "As the weather becomes hotter as a result of global warming we expect there to be an increase in this kind of migration to the UK." The most invasive ladybird on Earth has landed in the Wey Valley. Having been first detected in Britain in the summer of 2004 the harlequin ladybird (Harmonia axyridis) is spreading fast throught the southeast of England and is threatening the 46 species of native ladybird (Coccinellidae). The Harlequin Ladybird Survey has been launched (2006) to help monitor just how and where the harlequin has established itself. Jointly funded by the National Biodiversity Network, DEFRA, the Natural Environment research Council and the Joint Nature Conservation Committee the survey is in response to the highly invasive nature of the species, which is also known as the Multicoloured Asian Ladybird. The extreme concern over the harlequin is that the species can seriously affect our native ladybird species. They are extremely effective aphid predators and have a wider food range than most aphid predators (such as our seven-spot ladybird) and so can easily out-compete them. Unlike native species the harlequin doesn't require a dormant period and so has a longer period in which to reproduce. They can also cover long distances allowing for rapid expansion. An additional threat is that if aphid supplies are low the harlequin will eat other ladybird eggs, larvae and pupae as well as butterfly and moth eggs and caterpillars. In a radio phone-in (BBC2 November 2006) many listeners were reporting sightings at a time when most of the native species were in hibernation over winter, and also revealed the nuisance of home invasion with furnishings staining (harlequins exude a yellow fluid as a defence mechanism) and smell. Harlequins also bite humans and damage soft fruit. Unfortunately the harlequin ladybird is not always easy to identify as the species can vary considerably in colour and markings from the common variety pictured (first picture in article), as its common name of 'harlequin' suggests. 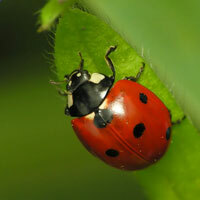 Charts can be downloaded from the Harlequin Ladybird Survey website to aid in identification. If its red with precisely 7 black spots, it is a 7-spot ladybird. If its less than 5 mm (1/5 inch) in length, it is definitely not a harlequin ladybird. 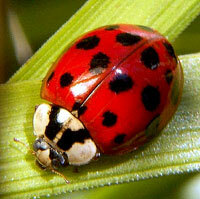 If it has white or cream spots, it is a striped ladybird, an orange ladybird or a cream-spot ladybird. If it has an orange pronotum, and fine hairs all over the elytra (wing case), it is a bryony ladybird. If it is black with four or six red spots, two of which are right at the front of the outside margin of the elytra, it is a melanic (black pigment) form of the 2-spot ladybird. The critically rare species of red-barbed ant (Formica rufibarbis) has only one known nest on mainland Britain. The solitary location on Chobham Common however has become a focus of an initiative by the Surrey Wildlife Trust to save the species. Teaming up with the Zoological Society the Trust is using a Heritage Lottery grant of £49,000 to find other Surrey sites to help restablish the ant, whose demise has been blamed on diminishing south-facing heathland sites through urban development and raids by other ant species on the colony's eggs. One potential site has been identified on Wisley Common. "They are hijacked by slavemaker ants who bring them up as their own," said Jill Barton, head of conservation for the Trust. "It's not a giant panda but it is a species of animal and if we can't try to save it from extinction it's a bad state of affairs." The Chobham nest only has female ants remaining so zoologists will capture them to instigate a breeding programme at London Zoo before returning them to their natural habitat. The only other UK location for the species is off-shore on the Isles of Scilly. British beekeepers are monitoring the alarming spread within Europe of a highly aggressive species of Asian hornet, the giant-sized Vespa mandarinia. The invasive insect was first reported in France in 2004 having been unwittingly brought into the country with a shipment of pottery. The hornet attacks bee hives and feeds the bee larvae to their own offspring, and can quickly decimate bee colonies. The hornet is the world's largest and has a body length of between 1.1" (27mm) and 1.8" (45mm) with a wingspan of around 3" (76mm). The hornet's venom is particularly potent and contains eight distinct chemicals which destroy tissue, cause paralysis and release an odour that attracts other hornets to the victim. An entomologist from Japan who has studied the insect described the sting sensation as feeling "like a hot nail being driven into my leg." 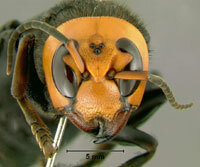 No instances of the hornet having established itself in Britain have yet been reported (2007). The renowned conservationist David Attenborough, who is the president of the charity Butterfly Conservation, has highlighted the worrying decline of Britain's larger moth species, especially in southern England. A campaign to raise the moths' plight, Moths Count, was launched (April 2007) to help halt the decline and improve its much maligned image. The popular image of the moth is of an ugly cloth-eating pest, which Moths Count wish to dispel. A report, The State of Britain's Larger Moths, published in 2006 revealed that a third of Britain's 900 larger moth species has slumped by 32 percent since 1968. The decline is threatening species of birds, bats and small mammals that feed on them. "Moths represent the hidden wealth of wildlife on all our doorsteps. 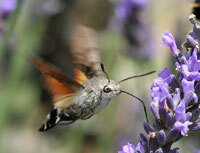 Without moths plants will not be pollinated and our garden birds would go hungry," said Richard Fox of Moths Count. "Currently there's an image problem. That's partly because moths are perceived to be of the night, although many moths are day-flying just like butterflies and just as beautiful too. There are also all those references to moths eating clothes, which go back to the Bible. The reality is that only about half a dozen of Britain's 2,500 species of moths damage clothes." The diversity of moths has increased overall in Britain although overall population numbers have decreased. The reasons for their decline include climate change, a loss of habitat due to intensive farming and the use pof herbicides and pesticides. Moths Count has launched a four-year campaign made possible by a Heritage Lottery Fund grant of £806,000 and will include a National Moth Recording Scheme, a wildlife observation weekend on the 23rd and 24th June (2007) and a National Moths Night on 11th August. More than 25 species of moth have become extinct since 1900 with the last, the Essex Emerald, believed to have disappeared by 1991. In National Insect Week (June 2008) the People's Trust for Endangered Species called on gardeneres to take part in its Bury Buckets for Beetles Campaign. Surrey and the Wey Valley is one of the few areas in the UK which records higher than the national average populations of stag beetles, which were once an extremely common species across Western Europe. However, due to severe losses of habitats for the beetles they are now classed as nationally scarce and the Bury Buckets campaign seeks to rederess that. "If you do one thing this National Insect Week, help threatened stag beetles by burying a bucket containing woodchip," said Jill Nelson the chief executive of the Trust. "A buried bucket provides an ideal breeding site where female beetles can lay their eggs and where resulting larvae can remain safely for at least four years while they develop into adult beetles." Guidelines on how to prepare a beetle bucket can be found on the Trust's website HERE (594k PDF doc).